Regaine for Women is used for the treatment of female-pattern hair loss, or androgenetic alopecia. It encourages hair growth and increases the diameter of the hair shaft, reducing the overall appearance of hair loss. The active ingredient in Regaine is minoxidil, and the specially formulated foam had an 80% success rate in clinical trials, also stabilising hair growth in 4 out of 5 women. Regaine will only treat androgenetic alopecia, and not hair loss caused by anything else such as stress. Androgenetic hair loss is often associated with a condition called polycystic ovary syndrome, possibly because of the increased amount of androgens that it causes. This is normally characterised by gradually thinning hair on the top of the scalp, and not patchy or sudden hair loss. It can take between 12-24 weeks to see an improvement, so don’t give up until after this time, in which case, you should consult your GP for advice. What is Regaine for Women? Regaine for women is a medicinal foam that is used to treat androgenetic alopecia in women (also known as female-pattern hair loss, or FPHL). The foam contains the active ingredient, Minoxidil, which works to stimulate hair growth and support existing hair. Regaine for women has been proven to stabilised hair growth in 4 out of 5 women with androgenetic alopecia during clinical trials, making it an incredibly effective treatment for a condition that can often cause embarrassment and low self-esteem. How does Regaine for Women work? In women with androgenetic alopecia, the anagen phase becomes shorter, resulting in thinning hair. This is where Regaine for women comes in to save the day. 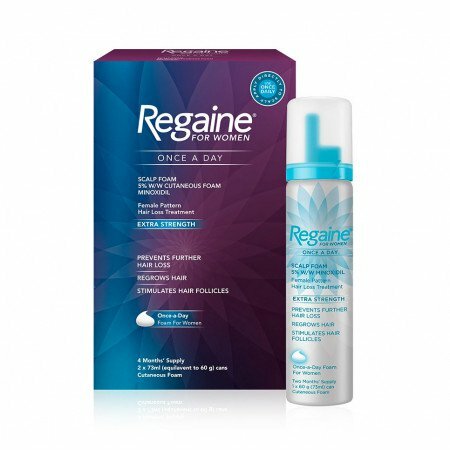 Regaine for women achieves these results by increasing the blood supply and nutrients to the hair follicles, reversing the shrinkage of them and stimulating them to start the growth phase. Ultimately, this means that hair will grow back thicker, and balding at the top of the scalp is reduced. Regaine isn’t a cure for female-pattern hair loss, in fact, there is currently no known cure for the condition. However, Regaine for women is effective at reducing the symptoms and appearance of hair loss. Is Regaine for Women the right treatment for me? Regaine for women is only for the treatment of androgenetic alopecia, which has characteristics such as thinning hair on the top of the scalp. Androgenetic alopecia is often associated with polycystic ovary syndrome (PCOS), and it’s thought that this is due to the elevated androgen levels that the condition causes. You must make sure that your hair loss is down to androgenetic alopecia before buying Regaine for women online. It is estimated that one in 4 women in the UK experience hair loss at some stage in their lives, but not all of these will experience androgenetic alopecia. It is thought that female-pattern hair loss is a hereditary condition, with women inheriting it from one or both sets of parents. Your risk of developing androgenetic alopecia is increased if a close family member has suffered with it too. Many women with this type of hair loss will notice that the condition peaks around the time of the menopause, though it can start much sooner, with some women experiencing it in their 20s or 30s. Other causes of hair loss can include stress, pregnancy, and fluctuation in hormones as well as other conditions, but if you notice sudden or patchy hair loss, or haven’t got a family history of alopecia, please make an appointment with your GP to determine the cause of your hair loss and which treatment option would be best for you. Some women may see results in as little as 12 weeks (or 3 months), but it should be known that this treatment can take a while to work, and requires a fair amo unt of patience and perseverance. Most women will start to see an increase in hair growth within 24 weeks, so if you don’t notice an improvement after this time has passed, please make an appointment with your GP as Regaine for women might not be the most suitable treatment for you. How do you use Regaine for Women? Regaine for women comes in two strengths: 2% and 5%. The 2% strength is usually a twice-daily application, whilst the 5% should only be used once daily, usually at night before you go to bed. The foam is a topical treatment and should be applied directly to the area you want to be treated. The foam resembles styling mousse, and should be applied to a dry scalp. The solution air-dries so there’s no need to wash your hair after use, as this can actually stop the medication from working. Depending on which strength of Regaine you use, the dosage may be different, so make sure to read the patient information leaflet that comes with your treatment. You should massage the foam into the problem areas before thoroughly washing your hands to make sure it doesn’t come into contact with other areas, and to avoid accidental ingestion. Some women have reported that within 4 months of stopping treatment, the regrowth disappears and they continue to experience hair loss. Because of this, it is recommended that you continue treatment in order to maintain your hair growth. Most commonly, women may experience headaches and some skin irritation or redness around the site of application. This is usually mild and subsides within a few days, but if you’re finding it troublesome or severe, please discontinue using Regaine and contact your GP. Some women have reported experiencing hair changes, such as colour and texture, but the frequency of this is not currently known. You may find that when you first start treatment, you notice more shedding than usual. This is completely normal whilst the hair follicles prepare to move from the resting telogen phase to the growing anagen stage. This shedding usually subsides within 2 weeks, but if you’re still experiencing it after this time, you should stop using the treatment and seek medical advice. Whilst rare, some people report dizziness after using the foam, so make sure you know how it affects you before driving or operating machinery. Using Regaine more than once a day, or using more than the stated dose won’t make your hair grow back any faster, but will increase the likelihood of you experiencing side effects. Please follow the manufacturer's printed instructions or as directed by your own doctor.